There is no cost to using this kit and the included resources, but if you find them valuable, please consider making a donation to The Longest Table Dayton project fund at thelongesttabledayton.com/donate. 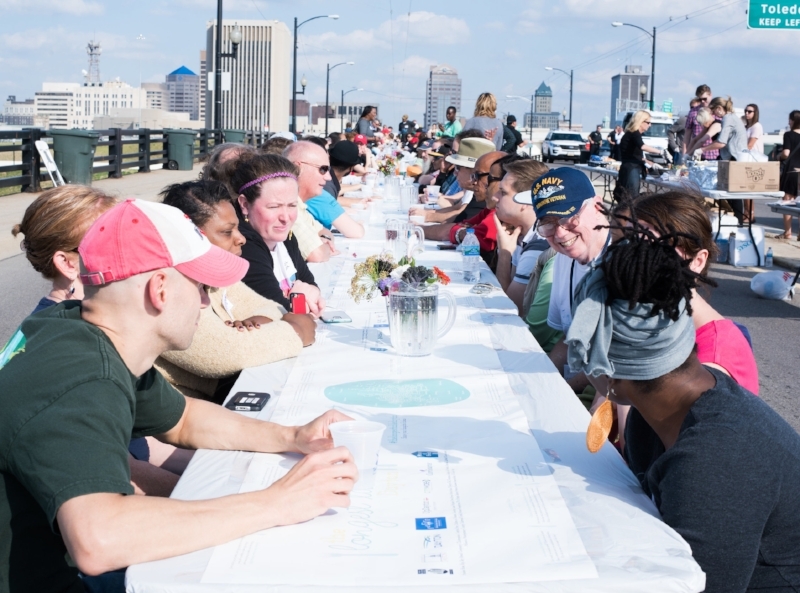 In Dayton, we chose holding the meal at a long table spanning the Third Street Bridge. We’re a city that is segregated by a river that splits our community's geography between east and west Dayton. Crossing the river is coded language for black and white communities of Dayton. For context, the historic Wright-Dunbar neighborhood across the river from downtown was the site of intense race riots in the 1960s and the bridge once hosted a 7,500 person Civil Rights March. After our first big meal at the Third Street Bridge, we rotated monthly, smaller meals into different neighborhoods around the community. These meals consisted of around 50 to 80 people. We typically partnered with a local spot within the neighborhood that highlighted the good in that community. For example, a neighborhood sometimes associated with negative things like heroin and prostitution could be redefined by having neighbors come together in a new community garden sitting atop a hill with a great view of the city’s skyline. Food access is also an issue in our city and a meal in a community garden helps ignite valuable dialogue about how we can increase food access and production at a neighborhood level. The smaller neighborhood meals allow for this sort of dialogue to blossom. The site of the venue is one of the most important parts of the planning process. A good location draws people to the event. It never hurts to pick a space with high traffic so people just walking or driving by can stop and participate as well. Pick a space that is meaningful and unique. Pick a place people have never engaged in this sort of way. Choose somewhere with meaning and history. Think about what would make for an amazing visual that would galvanize someone to step outside their comfort zone. Properly setting up tables and chairs for the event can seem pretty self-explanatory, but what you decide on can impact the conversation. There's also several ways you can line up your tables depending on what resources you have at your disposal. We’ve held 80 person meals with ten round tables each holding eight people. We’ve also held a 650 person meal where we lined 8-ft banquet tables all the way across the bridge with occasional openings along the way. Both styles allow for different kinds of conversations. With circular tables, participants are more likely to stick with their group and have a singular group conversation. Rectangular banquet tables allow participants to turn to the next table or have a side conversation with one or two other people. For our meals with <`100 participants, we tried to identify venues and partners who could provide tables & chairs at no cost. Weather permitting, we've even loaded up pick up-trucks full of indoor tables and chairs and driven to an outdoor venue nearby. For our really large events, we pay to rent tables and chairs and have them delivered by the vendor to the site. Once you’ve set up the tables and chairs, make sure to have visible Table Numbers for people to easily locate where they’ve been assigned to sit. We talk more about this in the registration & arrival section. Ask a local florist to donate flowers. Place them in vases on your table to create an even more inviting look & feel. The originators of the Longest Table, (Tallahassee Florida’s Mayor’s office) once advised us, “Don’t worry too much about the food because the conversation is the centerpiece.” Whenever we've been nervous about quantity or quality of food, we have pushed through with this notion and used it to set the tone for events. It doesn’t hurt to fundraise and pay local caterers to provide scrumptious food but we’ve also had amazing success partnering with our local food pantry/soup kitchen to prepare and donate food for our meals. If you go this route, remember to send volunteers to help make the food. In our own experience, it doesn’t hurt to seek out local restaurants that are eager to donate a tray of sandwiches or pizza! Remember, this is a free event. If you communicate that this is a volunteer based operation and that we’re truly here to break bread with strangers, and grow as a community, you should be just fine. We frequently receive requests for gluten free, vegetarian, vegan, or kosher options. If you can’t accommodate, make sure to vocalize that in your materials. At some meals, we also suggest folks bring a dessert. This way they have a little skin in the game and feel they are helping put on the event too! Its also a great way to allow folks to show off their secret family dessert recipe. Once you have decided how to set up your tables and chairs, you need to finalize your placemats. Atop the placemats are the conversation continuing questions. You can go with what we have supplied or you can add your own. Make sure to place a map of your community in the middle of the mat because it allows your participants to familiarize with where their fellow guests live. It also allows for folks to scribble their thoughts and favorite moments atop the placemats. The mats can also be adorned with your sponsor's logos and your creative hashtags for the event! You can do all the footwork in the world but if you don’t get the word out about your event, people won’t come! Make sure to check community calendars so you don’t accidentally plan against any major events that happen the same time every year in your community. While checking, remember to keep in mind major religious holidays (of all faiths!). Keeping this in mind helps make sure your meal is as inclusive as possible. We mention picking the right date because as soon as you have finalized your date, you will want to have a Facebook page, flyers, and online registration ready to rock. Your goal for promoting the event is to both hit your target number for butts in seats while also keeping your table as representative of your community. Dayton is 40% black so we always worked toward getting the table to be a similar composition. Additionally, while you track your own registration, remember to ask for neighborhood so you can look at where you have work to do. Not all demographics will find out about your event the same way. You’ll want to send volunteers to engage neighborhood association meetings, places of worship, local tv and radio bits, other organizations that might want to collaborate. It may take some preliminary meetings with leadership in the community to get the right advocates to help bring your meal to life. If you are part of local government or a major non-profit, you’ll still want to make individual calls and emails to folks who can help push out your event in newsletters, email chains, and on social media. We also had informational tables at events, walked neighborhoods that historically didn’t come out to events with door hanger invitations, and even did targeted Facebook ads for demographics we were aiming to engage. This is an area, where you get what you put in. Do the footwork, and you’ll see the return on the day of the event. We learn something new every time we host a meal. There are always ways to improve your event. We strongly suggest you take into consideration the following things to augment your participants’ experience! The Longest Table is a community meal driven by folks who have made a decision to come together and talk about their community. We’ve found that an assigned a Table Host, or volunteer to each group of 6 or 8 people is incredibly beneficial. This person can help the conversation move along and make sure it doesn’t get stuck in one community topic or problem for the duration of the meal. We’ve attached a training outline for advice on how to properly train Table Hosts but remember, these folks should be their to help the conversation along not lead it. A good Table Host helps the conversation flow naturally, it should feel organic. Just like any sort of community event, you’ll need volunteers. Try to imagine yourself from the perspective of your participants. What would you hope to have happen if you were walking up to a community conversation? You’d want friendly and excited people to greet you, give you an idea what to expect during the meal, and tell you where you should sit! Some volunteers will be perfect for checking people in, others will help set up the food, tables and chairs. Other community leaders might not be able to show up but they can help arrange for funding and other resources. Some folks might only be able to help set up but then have to leave, that’s ok. Their participation in the event in any way, is a net positive for your community. Remember to thank everyone! Imagine someone stepping out of their comfort zone and attending a new event like the Longest Table Dayton. We want them to feel welcome and provided the most seamless experience possible before starting their meals. This is challenging because the folks at registration have a big job. Whoever sits at the check in table will need to attempt to split up folks who know each other. If they insist they sit together, that's ok. Always remind folks that they get out of the experience what they are willing to put into the experience. We have always allowed for walk up registration. Try to have someone walk them from the check-in table to where the seats are located. Instruct that individual to highlight the table numbers so they can easily find their group. A simple sign-in sheet would work.